Elter – the U7 female. This is a Cumbrian word from the Scandinavian word eltr meaning swan (eg Elterwater) Elter has particularly lovely white under feathers! Artegel – the U8 male – this is from Wordworth’s poem ‘Artegal and Elidur’ about Ancient British Kings. Choosing the names was a really difficult decision, with over 100 names put forward by members of the public, many of them beautiful and relevant. Over £200.00 was raised for the project which we hope will go towards the fund for new optical equipment for next year. Thank you to all those who took part. If anyone wants to donate now through Just Giving there is a link on the home page of www.ospreywatch.co.uk. The chicks continue to do well and are flying around the Bassenthwaite valley and perching on dead trees and branches, which may look like fun and games to us but in fact is serious practice for the long migration in a few weeks time. This uses up a lot of energy and they are generally quite hungry so Unring the adult male bird is providing them with lots of plump perch. KL their mother is still here but will be off to Africa as soon as she has built up fat reserves and is in good condition. The initial good weather gave all our chicks a head start and perhaps a bit of overconfidence. The windy days of Thursday and Friday saw quite a bit of buffeting in the air and in some cases taking off and then flying backwards, which left them a little nonplussed. U7 fled to the nest at one point, as a safe haven, but found that even taking off from there was fraught with danger. She had to experiment for some time, looking a bit like an umbrella on the verge of turning inside out before finding that the trick is to lean into the wind rather than it coming at you broadside. 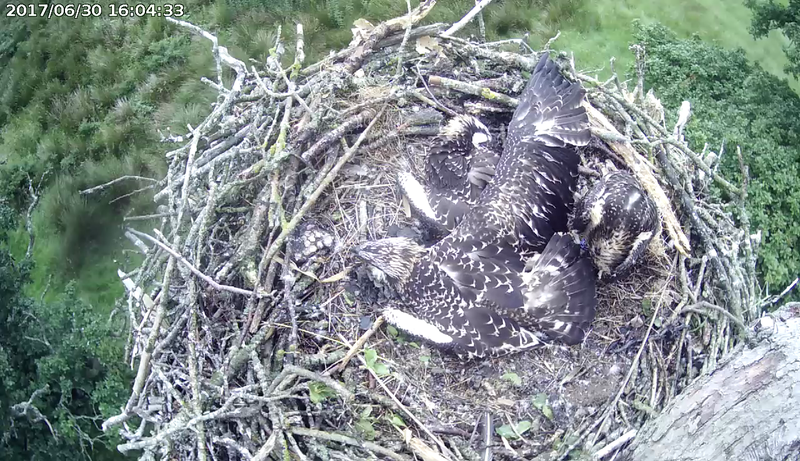 All the chicks have been seen from the Lower Viewpoint at Dodd flying over the edges of Bassenthwaite and enjoying the occasional splashdown. However, it is Unring that is still doing all the fishing. Today, he caught a fish so enormous that he dropped it – viewed by one of his offspring sitting on a nearby post and KL, bathing just a few yards away. 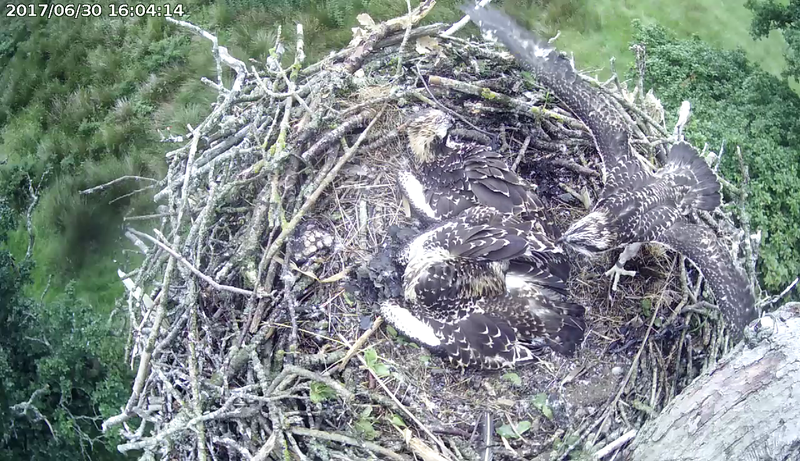 U7 managed to hoist herself off the nest – largest and definitely not least. This was Saturday’s effort and since then all three chicks have been positively whizzing around the immediate area of the nest in the bright sunshine. lots of lift and a bit of breeze means they wobble a bit but have not crash landed! We waited all day yesterday for either U6 or U7 to have the courage of their convictions to lift off. But No! Neither could bring themselves to follow their brother. Today U7, the bigger female was giving it a really good go, helicoptering feet above the nest and then dropping down. Will she go? Won’t she go? Will she go? Oh! Where’s U6? A gust of wind, just as he opened his wings, did the trick for him and away he was blown to a nearby branch. And there he has stayed for the day, unable to come to terms with a different perspective on the world. 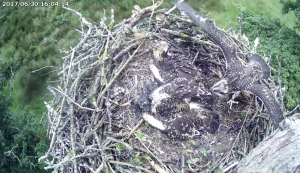 Unring has been bringing fish to the nest this afternoon, eaten by sedentary U7 and visiting U8 and so we are confident that a famished stomach will blow him back before too long. Like Harry Potter U8 is a ‘natural’. Although only into his first full day of flying he is managing very well with no crashes or bludger hits that we have seen. He is staying close to the nest and making short forays out and back. Sometimes it takes a few circuits to get into a good position for landing back on the nest but he has avoided his sedentary siblings so far. 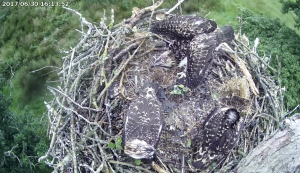 U6 and U7 are looking with great interest at the gyrations of their brother and have had us with hearts in mouths a few times when they have teetered on the edge flapping wildly. But as of 16.00 hours neither had had the courage to jump. An interesting incident today involved an extra osprey around the nest. The intruder, flying overhead had a fish (seen catching below the viewpoint) and as in a previous incident this year it dived from a height above the nest and delivered the fish (a perch) to the 2 cowering chicks, bypassing KL, Unring and flipping past U8. What is this all about? Congratulations to the Kielder Forestry Commission team who are celebrating their 50thchick. They currently have 4 breeding nest sites in the forests around the huge reservoir. Here’s a quick quote from one who watched it happen on the Whinlatter screens! No pictures for the moment can be uploaded onto this site. 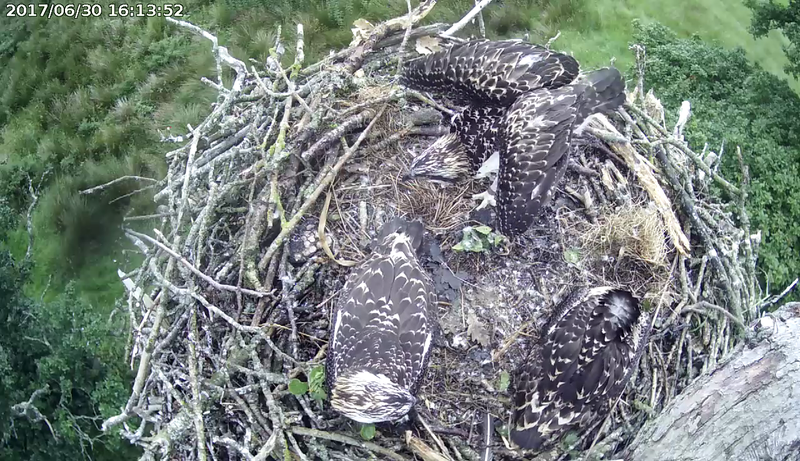 However, hopefully the chicks can be seen on the live stream. They are now into their 7th week and their muscles are developing with exercise interspersed with rest. In week six they were also preening vigorously to release their feathers from the sheaths. This process is now largely complete although there still looks to be another centimetre or two to grow on pinions and tail feathers. Flapping is now strong enough to carry the birds in hops across the nest and they are all spending time balanced precariously over the void and looking down. Like many birds of prey they stare at a particular point and then move their heads rapidly from side to side. They are probably triangulating distance as they have no other practical way of knowing how far things are from the nest and thus where they might land on that important first flight. Join in with the Work-out. Until now our chicks have only had a couple of goals in life – to eat and to sleep – and as a by product of that, to grow. But now another element is added on to the equation. Exercise! For the next 2 weeks they will be putting in the hours with a gruelling training programme, worthy of Olympic contenders. Fledging is comparable to ski jumping, combining the elements of great height, fast descent and the real possibility of a fatal crash landing. But whereas a ski-er can build up from small to large jumps our chicks will have only one chance to get it right when they launch themselves for the first time into space. It is not just the glory of winning a gold but a question of survival. So, between feeds and snoozes our chicks are now stretching, extending and flapping those unwieldy wing appendages that have developed so fast. Legs are also being strengthened with a regime of knees bend. If you’re feeling a bit unfit yourself feel free to join in. Before you know it, there may be a new Eddie the Eagle in the making!